Enjoyable, superbly animated and frequently funny adventure with great voice work, strong characters and some excellent fight scenes. 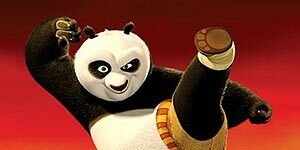 Jack Black voices Po, a lazy, overweight Panda who idolises the Furious Five kung fu champions: Tigress (Angelina Jolie), Mantis (Seth Rogen), Crane (David Cross), Viper (Lucy Liu) and Monkey (Jackie Chan). However, when Po gatecrashes an initiation ceremony, he is accidentally chosen to be the mythical Dragon Warrior, who is destined to save his valley from the villainous leopard Tai Lung (Ian McShane). The Furious Five are mortified that Po has gatecrashed their ranks, but Master Oogway (Randall Duk Kim) tells them that there are no accidents and this is indeed Po's destiny. However, when word reaches the Five that Tai Lung has escaped from prison, Po has to get into shape fast, so he begins training under Master Shifu (Dustin Hoffman). The film is excellently animated throughout, particularly during the opening fantasy sequence, which pays homage to TV series Samurai Jack. There are also some stunning action set pieces, most notably Tai Lung's breathtaking escape from jail and Po's dumpling chase fight with Shifu. The voice work is superb: Hoffman and Black make a terrific comic team, sparking off each other nicely and delivering some hilarious gags. Meanwhile, Jolie and Rogen add colour as Tigress and Mantis, whilst McShane is perfectly cast as the evil Tai Lung. The only problem is the plot sticks closely to all the usual cliches, so you're never in any doubt as to where it's all going. Similarly, Po's transformation happens too quickly, which is slightly disappointing. In addition, some of the characters get short shrift, most notably Viper, Crane and Monkey – why cast Lucy Liu and Jackie Chan if you're barely going to give them anything to do? Witty, brightly coloured and well animated, this is an entertaining adventure that will appeal to both kids and adults. Recommended.